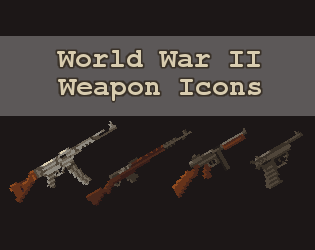 World War II weapon pixel art icons. This asset pack includes 26 icons of arms used in the Second World War: 6 light machine guns, 4 submachine guns, 4 pistols, 4 bolt-action rifles, 3 semi-automatic rifles, 2 anti-tank weapons, 3 grenades. Full list of weapons: BAR, Bazooka, Bren LMG, Colt M1911, DP 28, Enfield No. 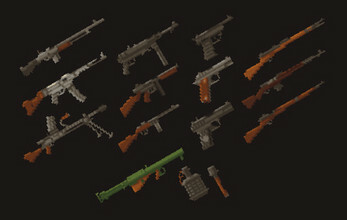 2, Gewehr 43, Karabiner 98k, M1 Garand, MG 42, Mk2 grenade, Mosin Nagant, MP 40, Panzerschreck, PPSh41, Springfield M1903, Sten, StG 44, stick grenade, SVT-40, Thompson, Tokarev TT-33, Type 97 grenade, Type 99 Arisaka, Type 99 LMG, Walther P38. For free and commercial use, may not be redistributed or claimed to be made by any other person.